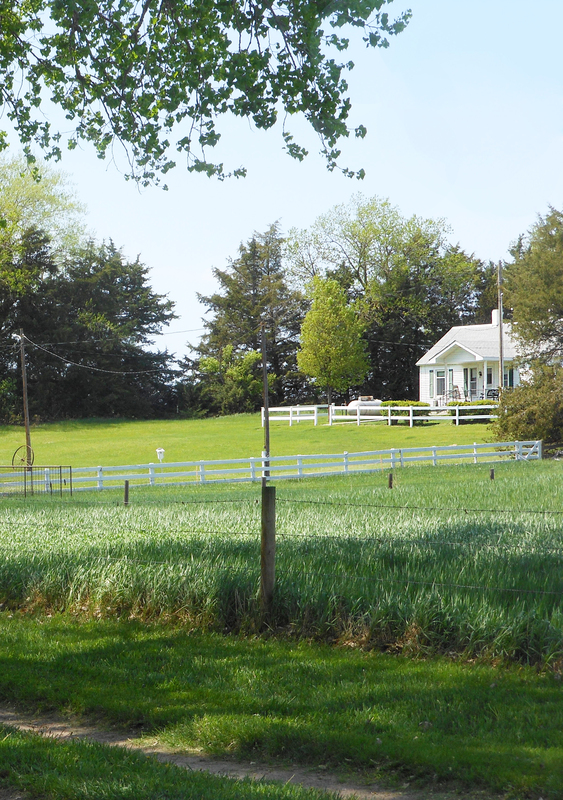 Nestled deep in the Sandhills between Elgin & Bartlett, Nebraska, you'll find a charming guest house that offers the chance to unplug and unwind while experiencing the beauty of nature. Soak in the serenity, admire the wildlife, and enjoy some R&R at this tranquil, peaceful, and cozy cottage. We know the lure of our little slice of heaven is the peace and quiet and solitude. So when you book a stay at the Sandhills Hideaway, the place is all yours. The only time you'll see us is when we meet up to hand over the key! Natural beauty abounds when you're out here in the Sandhills. From the plant-life to the wildlife, the scenery is vibrant, and the views are truly second to none. Spend your evening relaxing on the porch and taking in a stunning Nebraska sunset. Leave the hustle and bustle behind for awhile in favor of a serene piece of land where the sun is bright, the air is fresh, and the grass is green. When you get away from the bright city lights, you can finally understand what it means to truly stargaze. 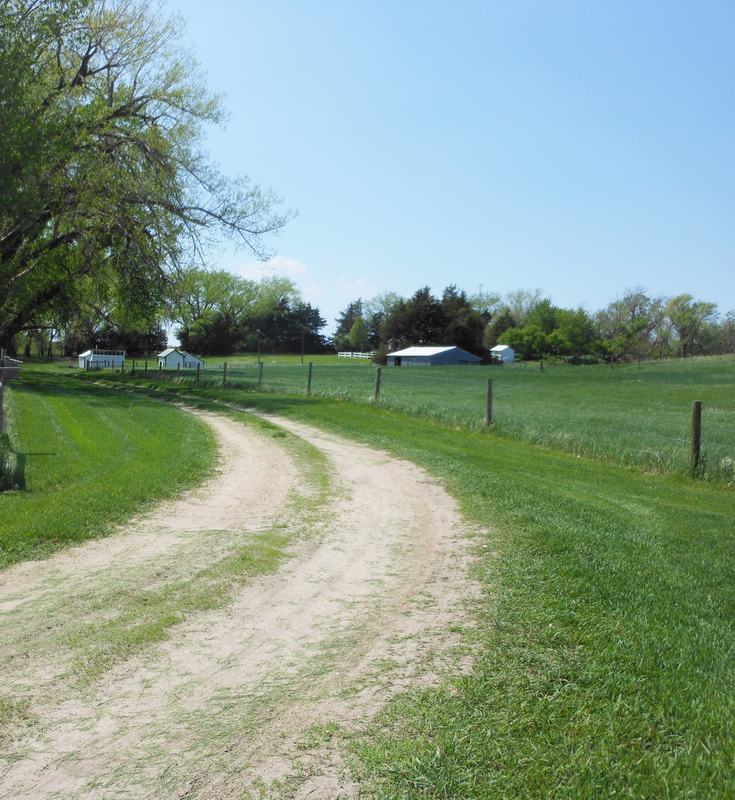 The Sandhills Hideaway guest house is a local treasure tucked away in rural Nebraska between Elgin and Bartlett. With it's quiet solitude, completely immersed in nature, Sandhills Hideaway is perfect for reunions and weddings; for retreats and meditation; for artists, authors, and creative types; or for travelers just passing through. 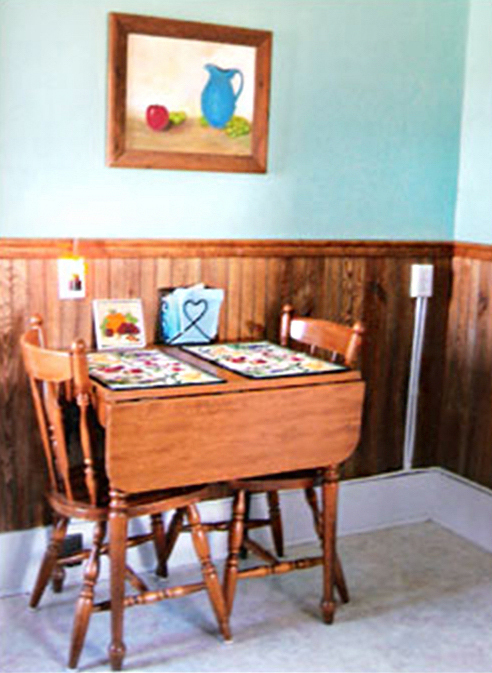 Here at the Hideaway, there are four bedrooms, one bathroom, a kitchen, laundry facilities, and several common areas. With one queen bed, a double bed, and three twin beds—as well as a couch—the home can accommodate larger groups and comfortably sleeps 7! And our spacious living room has ample floor space for your air mattress if more guests need to be accommodated. For the comfort and enjoyment of all of our guests, we ask that you help us maintain a pet-free and smoke-free environment. 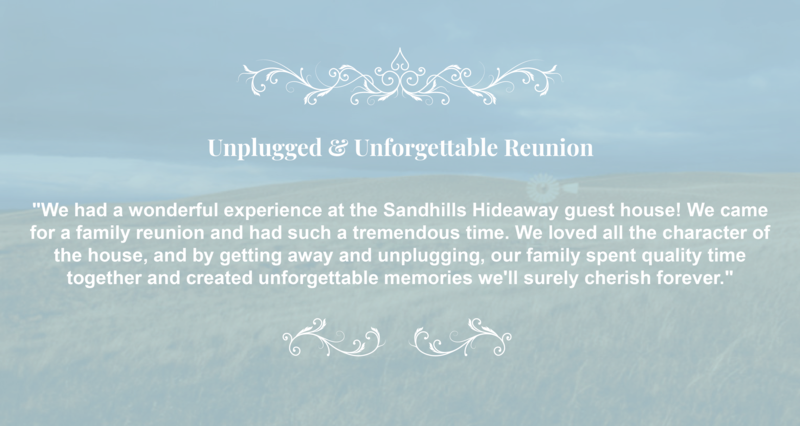 Come have an unforgettable experience at Sandhills Hideaway! 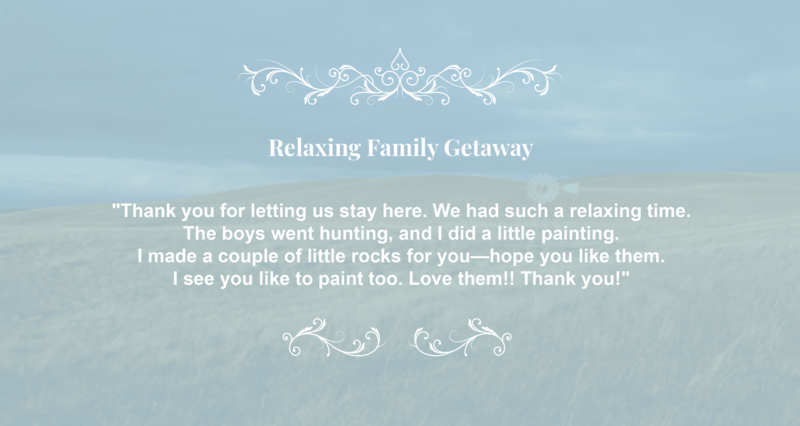 Read what our guests have been saying about their stays here! Are you ready to be the one that got away (for the weekend)? 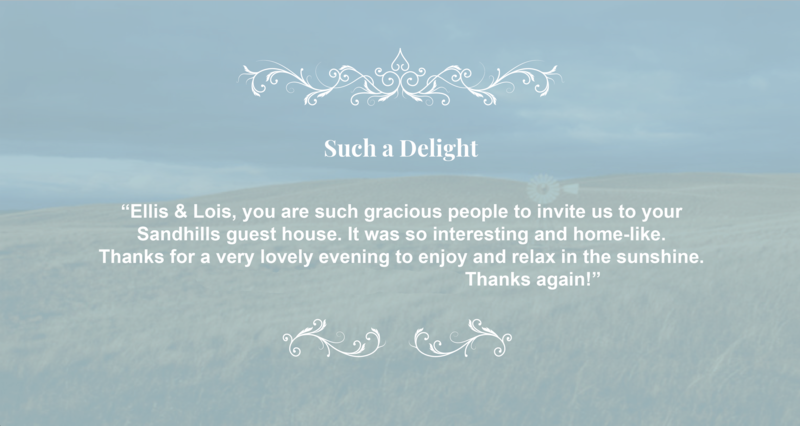 Then we are thrilled to have you and know you will enjoy your stay. Click here to request a reservation! We are so thrilled to have met and hosted so many happy campers. Itching to get out and enjoy the local social scene? Check out some area attractions and upcoming events! Drive west 12 miles on Hwy 70 to 509 Avenue. Turn and go north for 2 miles to 841 Road. Then go half a mile east and half a mile north. Go north of Bartlett to the 281/70 junction. Turn east and go 12 miles to 509 Avenue. Then drive 2 miles to 841 Road. Go east for half a mile and north for half a mile.